Growing up in Hawaii, you would think that I’ve got mango trees all around me and I could eat them anytime I wanted to. It’s partially true. I grew up on the Big Island and there are common mango trees. The catch is, most of them were in Kalapana, which is a pretty dang far drive from the main town of Hilo. If we wanted the ultimate mango, Hayden, they had to come from Honolulu, which was practically like the mainland for the Big Island. Sometimes my aunty guys would fly over to visit and bring a box packed with Hayden mangoes individually wrapped in newspaper. That was pure heaven for a few weeks. 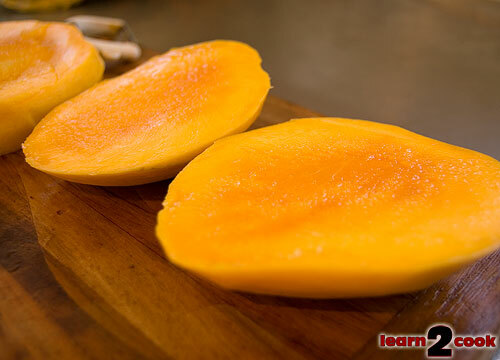 Anyway, shortage of the best mangoes led to me being a mango maniac. I love the stuff, which is why having two trees in our backyard now is like living in Eutopia. 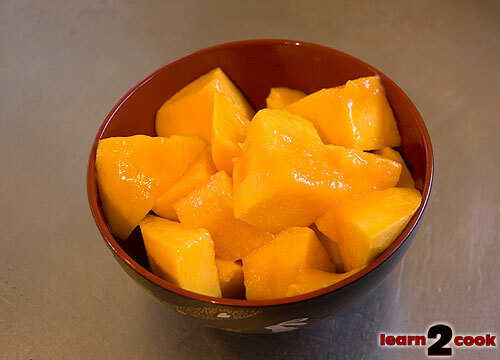 The mango I use in this article is a ripe Puree mango, which has a deliciously sweet and distinct flavor. 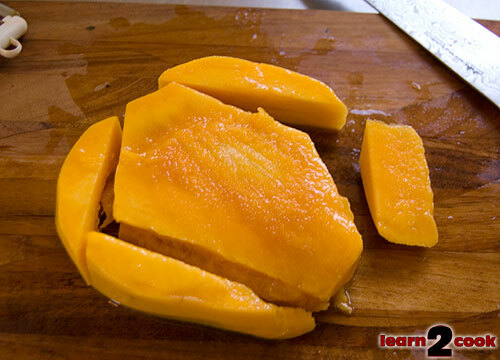 The first thing you do is wash your mango. Then, bust out your potato peeler, preferably a really sharp one. 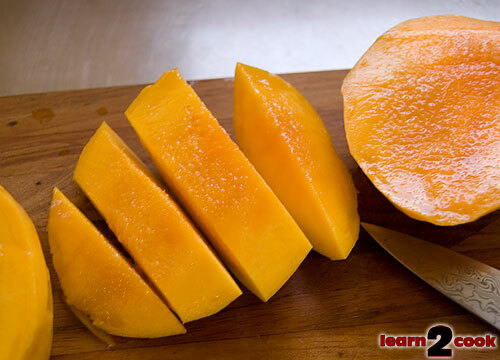 You should end up with a naked mango. If you are feeling particularly barbaric, you could just eat it right now. Next, slice the sides off. 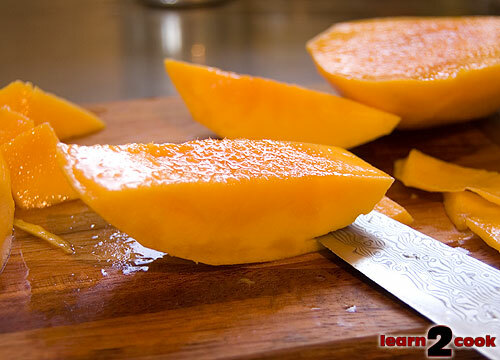 Slice with your knife parallel to the seed. 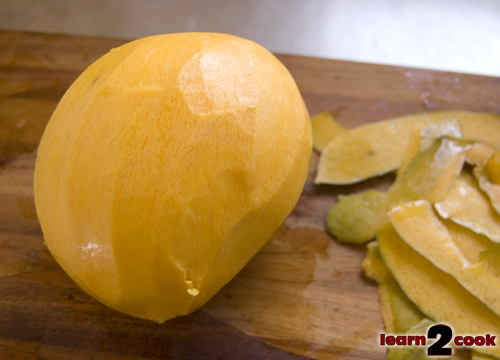 Look at the top of the mango. The seed is sort of flat, so you’ll want to cut off the sides that aren’t as fat. If you cut off the fat ends, your knife will snag onto the hair of the seed. Once you’ve cut off both sides, you should end up with two big halves and the flat seed portion. 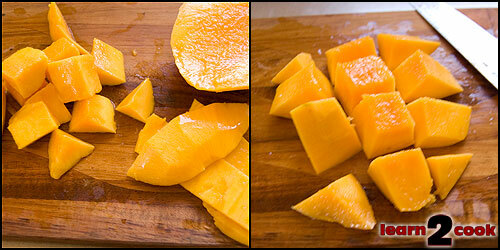 The two sides are the bulk of what you can eat, but you can cut off the sides of the mango too, which I’ll show later. Slice a half into strips. 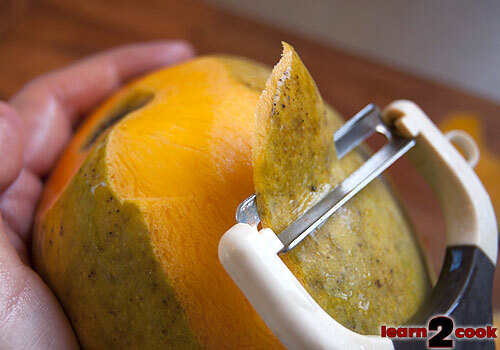 From here you can do two things, remove the hard shell that consists of the inner part of the skin you peeled off or simply cut the mango into cubes. My family is picky, so I have to cut the skin part off. This works out nicely though, because I love the skin parts. They eat the inner mango, I eat the outer shell pieces and we’re all happy. After that, cut the sides off the flat seed portion. From here, you can just eat the rest of the flesh off of the seed. 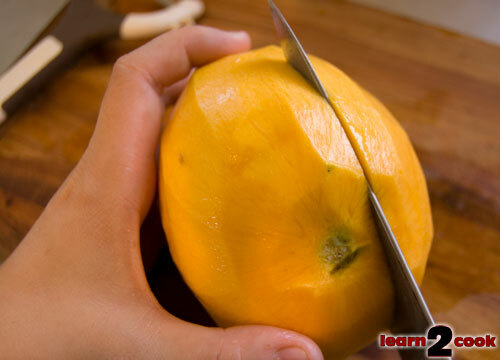 My dad always claimed this was the best part, but I’m not a big fan because the mango hairs get stuck in my teeth really easily and that is extremely annoying. Plus, if you let the hairs touch the sides of your mouth too much, your lips will get horrendously itchy. I’m talking sore itchy too, not ticklish itchy. It burns! Anyway, put it in a bowl and enjoy. Mango is much better when fully chilled.